As a rule thumb, if you chose a Guided trek through a reputable tour operator you should allow £150-£175 per day. This would be for a standard hotel-based trek with 2-3 star hotels and most meals, luggage transfers and transport included. If you choose to go self-guided, have no luggage transfers and stay in dormitories most nights, you should allow £70-£80 per day. There are many tour operators who offer the Tour du Mont Blanc in lots of different ways and so it is important to look at exactly what they offer as you may find that what you had expected is not included. The main inclusions would be transfers to and from Geneva Airport, luggage transfers between hotels and whether cable cars and public transport is included. Also, are lunches paid for by you when on the trail or are they provided by the agency? Lastly, find out what type of accommodation is provided and whether the trip is hotel-based (with or without attached bathrooms) or mountain huts or refuges offering dormitory accommodation and large communal bathrooms. Can I do the TMB in a week? 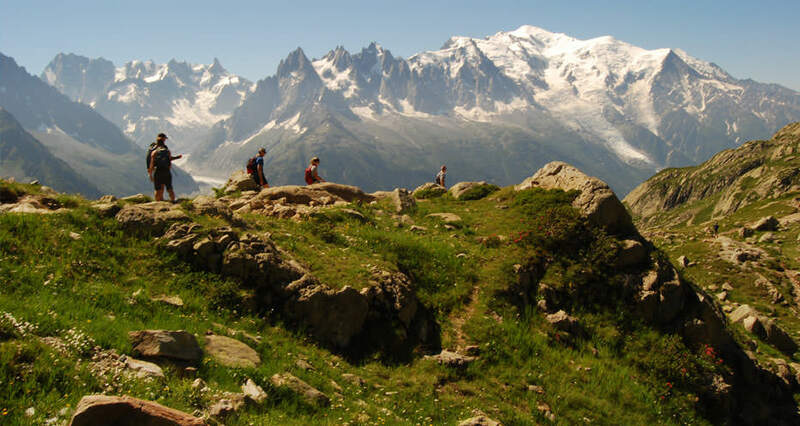 The minimum time one can sensibly complete the Tour du Mont Blanc is seven days, although even with this small amount of time, you will miss out a few of the sections and have to take private or public transport. Technically, there are ten sections that enable you to complete the hike. One or two of these can be combined into longer days and some sections are missed out as they are not regarded as highlights or the perhaps there are lots of ski lifts spoiling the view – as is the case above Courmayeur. Owing to the fact that most people have a limited amount of time to do the trek, most people will complete eight or nine sections with a day off to rest mid-way through the trip. With travel to and from the Chamonix Valley at the beginning and end of the trek, you should sensibly allow eleven or twelve days in total. Traditionally two weeks was the norm – with two spare days in Chamonix and days off in Courmayeur and Les Contamines or Champex Lac. Accommodation varies along the trail, though it is mostly 1-3 star hotels or mountain huts (refuges). There are 4 and 5 star hotels in Chamonix and Courmayeur, but you can’t do the whole trek in up-market hotels: they just don’t exist. The hotels along the trail are mostly small and many have been run by generations of the same family. They offer a good level of service, tasty home-cooked meals and a reasonable standard of bedroom – and many now offer ensuite bathrooms. The cost is similar from village to village and most hotels will expect you to eat dinner at their restaurant. The dinners tend to be included on a half board basis at hotels, though in Chamonix and Courmayeur there are a wealth of alternative places to choose from, ranging from small cafés to five-star establishments. Most people can take a three-course meal in a standard family-run restaurant for around €25-€30. Lunch will also vary depending on whether you buy a picnic from a supermarket for €5-€7, get the hotel to make one up for you for €10-€14 or take a hot lunch in a refuge for €10-€20. It is obviously cheaper to trek without a Guide, but Guides can offer you safety, peace of mind and take care of all the day-to-day chores needed on a major multi-day trek. When employing a Guide, you need to consider their daily pay rate and allow for their accommodation, meals, transport and any cable cars.